Home / boxing / news / sports / Mayweather vs Pacquiao scorecard results switched? Is it true that the results in the official scorecard of the controversial Floyd Mayweather Jr. versus Manny Pacquiao fight were switched? Mayweather won the welterweight unification championship match held at the MGM Grand Garden Arena in Las Vegas, Nevada, USA on Saturday, May 2, via unanimous decision. Judges Burt Clements and Glenn Feldman had an identical result of 116-112 while Dave Moretti gave a 118-110 verdict, all in favor of the undefeated American boxer. When news websites published the bout's official score card from the Nevada State Athletic Commission, a boxing fan from Ireland spotted something that caught his attention. 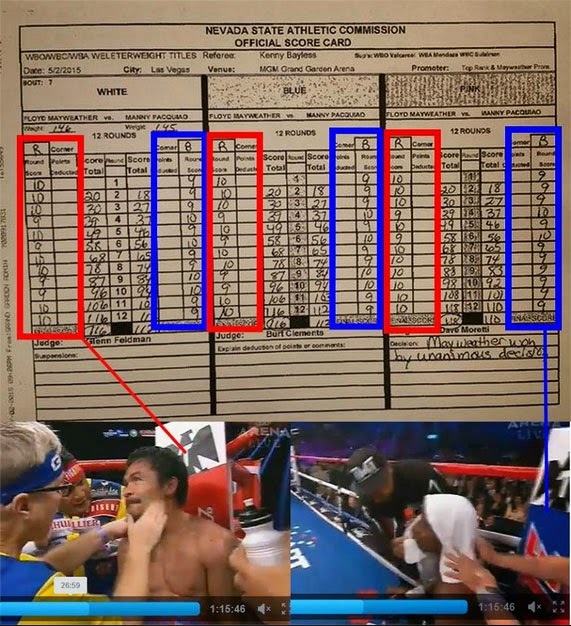 "This is interesring, Paquiao was the Red corner, Mayweather was the Blue corner, official judges appeared to have given the points to Paquiao yet result was a reverse, look what is hand written in the bottom of the score card on the right," Chris Cooke posted on Facebook after the fight. 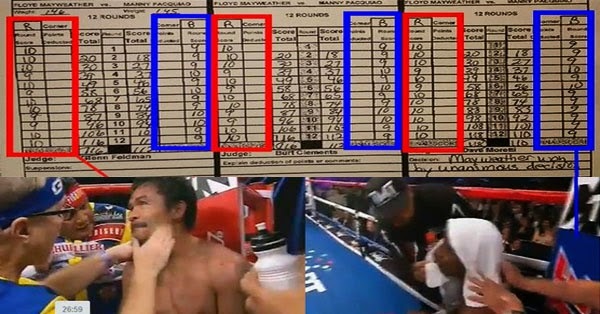 To illustrate and show proof of what he was trying to say, Cooke also posted a screenshot of the scorecard with red and blue boxes drawn on it, as well as screengrabs of a video showing Mayweather in the blue corner and Pacquiao in the red corner. "It seems the judges scored it as it should be but someone or some others decided to announce it the other way around? How could the decision written on the right hand side at the bottom be known or written on that card if the higher points were given to the Red corner (Paquiao)?" "Denga Missdee Phiriga because when the scores were read out they gave the high scores to Mayweather - blue corner and declared him the winner, the picture shows the high scores are for the Pacquiao - red corner so what happened? Was he robbed?"